Arkansas, Bradenton, Charleston, Chattanooga, Clinton, Columbia, Columbus, Delmarva, Carolina and Down East are new to the program. MiLB es divertido, and in 2019, it will be even more so. Copa de la Diversión is back, bigger and bolder for this season with more than double the participants of a year ago. On Monday, Minor League Baseball rolled out the 72 identities for teams across the country participating in this year's "Fun Cup," a season-long competition aimed at engaging, embracing and honoring Hispanic and Latinx communities across the baseball landscape -- up from 33 in 2018. "Since no other sports property attempted what we planned for Copa de la Diversión, we did not have a baseline to judge success," Minor League Baseball vice president of marketing strategy and research Kurt Hunzeker said. 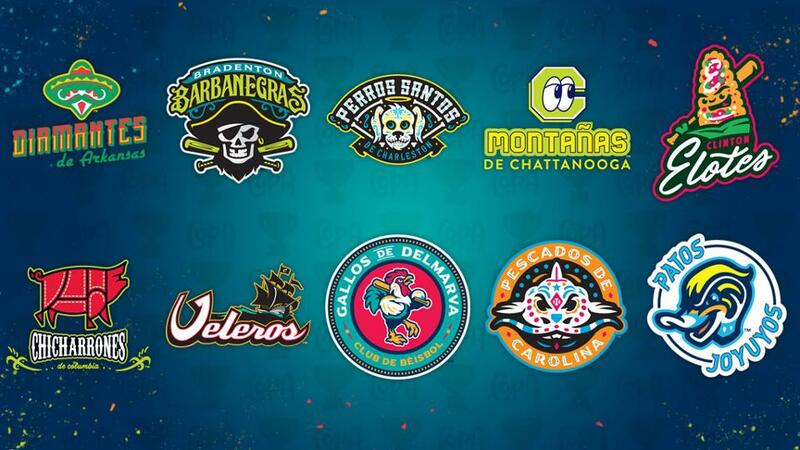 "We [MiLB and participating teams] worked for three-plus years researching and developing the Copa platform, and we knew that if we built an authentic, culturally relevant campaign, our entire fan base -- not just Latinx fans -- would embrace it." That confidence proved prescient. Copa game dates last year experienced an average boost of 12.6 percent year-over-year from the same game dates in 2017. Compared with regular games in 2018, last season's Copa contests saw crowds 24.4 percent larger. And the new logos, unlike anything most Minor League teams had ever attempted before, sparked a merchandising bonanza. MiLB initiated the process with last year's original 33 participating Copa clubs, after a small run of teams tested the waters toward the end of 2017. With 2019 and beyond in mind, MiLB shifted its strategy to a request-for-proposal process and brought in more than 50 interested clubs. This year, 72 participating teams will be chasing the Mariachis de Nuevo México, Copa's inaugural champions. Among those selected last summer was Class A Short Season Tri-City, one of 39 new participant franchises for this year. The Dust Devils immediately got to work crafting their Copa brand. Salem, Scranton/Wilkes-Barre, Tacoma, Trenton, Tri-City, West Michigan and Wisconsin have also joined the fold. "We created a team of Hispanic business leaders here in town," Tri-City general manager Derrel Ebert said. "After talking with some other clubs in our league and other clubs in our ownership that have done this, we kind of knew that was a strategy that had worked to be able to create a committee of individuals who are from the Hispanic community here locally and brainstorm and assess with them, ask some questions. That really led us to something that is both exciting for our Hispanic fans -- I think even our non-Hispanic fans are going to be excited about this -- and honoring to our Hispanic community." The product of an extensive creative process that involved the area's Hispanic Chamber of Commerce and Visit Tri-Cities will turn the Dust Devils into the Viñeros for select dates this season. "The backbone to why the Hispanic community is here in the Tri-Cities, or how they migrated here from Mexico, is agriculture," Ebert explained. "We have a lot of migrant workers in this area, and it's now second, third generations of those families that make up a great part of the population of the Tri-Cities, specifically Pasco, where the stadium is. We have a prominent Hispanic community, and it's large. What's great about that is we are proud of that as a community. We are proud of the fact that these folks have moved here and established homes and families here in the Tri-Cities." Fellow first-timers: Erie, Florida, Greensboro, Gwinnett, Hickory, Iowa, Lake County, Lancaster, Lansing, Lexington. Tri-City's squad will sport uniforms with a purple and green color scheme, inspired by the area's grapes and vines, along with a Brandiose-designed logo featuring a vineyard worker. "'Vineros' translates to 'vintager,' which is essentially one who works and harvests the grapes that are then used in the production of wine," Ebert said. "We are located in the heart of wine country in the state of Washington. We grow a lot of grapes here in the Columbia valley, and a lot of that happens right here in Franklin and Benton counties. "[The character is] a vintager. There are some pictures that we based this off of. A lot of times they have the hat for protection from the sun, clippers or pruning shears or something of the sort in the hand. Rather than that, we replaced it with a bat. And then there's the grapes. The grapes kind of bring it all together." The Dust Devils watched last year as the Copa program made its inaugural tour and have gotten input from trusted members of the MiLB family as to how to best join the fray. "Allan [Benavides] has been a huge help and a sounding board in just being able to get some ideas," Ebert said of the Eugene Emeralds' GM, who crafted his team's widely lauded Monarcas brand. "He's certainly shared some things that they thought worked and didn't work, how to be prepared for some things moving forward with how to construct the nights, how to advertise and market, how to unveil it. "That's been the biggest piece for us, being able to not be the first team to do it. Even at the Winter Meetings this year, there were a lot of breakout sessions and things that we were able to go to, to hear some of these teams talk about Copa and what they've seen that worked and didn't work. That was very helpful." Also new: Louisville, Midland, Modesto, Myrtle Beach, Nashville, New Hampshire, Norfolk, Reading, Reno, Richmond. Tri-City is hoping to experience the same type of success that franchises like Double-A Hartford did last year. "We were planning to do it, or something very similar, when the idea of the Copa program first came up, so it really worked out quite nicely," Yard Goats GM Mike Abramson said. "Minor League Baseball provides so much ground support that it really makes something we would've done all on our own better because there's power in numbers, and there's a lot of statistical and conceptual help that comes from the Minor League Baseball level." With a brand that has already experienced smashing success in its every day form, the Yard Goats became Los Chivos de Hartford last year, and the excitement that came with the alter ego amazed even Abramson. "I am still surprised by how many Los Chivos hats I see out in public," he said. "I'm still a brand geek, and I'm very proud of what we've built, so if I see somebody out in public wearing a Yard Goats hat, I just always go up to them like, 'Thank you for wearing that hat.' And if I'm in another state, forget about it. I'll go apoplectic. It's really cool. I see the Los Chivos caps everywhere." Like Tri-City, Hartford has established a relationship with its Latinx community since its earliest days as a franchise. The Goats worked with area leaders on their inaugural season Roberto Clemente jersey number retirement ceremony -- "We didn't want to get it wrong," said Abramson -- and have partnered on much more since. "We want people to feel a unique pride in what we're doing, but at the same time, I do think it's important to have people know that Minor League Baseball is so proactive in what they're doing culturally that this is a multi-team thing and I think well on its way to being every team," Abramson said. "To me, I think the statement is as important as the [Copa] program itself becoming more notable." This season, the Goats will play more games as their Copa brand, complete with Latin music and performances to public address announcements in English and Spanish and video board messages from the team's Latino players. This year's plans also include a home-and-home series setup with Richmond in which Hartford will play as Los Chivos and the Flying Squirrels will be the Ardillas Voladores. "I don't market the sport of what we do," Abramson said. "I market the entertainment. I would never use a digital billboard to put 'Yard Goats vs. Sea Dogs, July 12.' But with the games against Richmond, I'm slapping both of our logos up there, and it's going to be in Spanish, and the whole point is one, I think it's going to pique people's interest, and two, I want people in the community to feel really proud that that's how far we're taking it." Returning teams with new looks: Lehigh Valley, Durham, Hillsboro, El Paso, Lake Elsinore, San Jose. Player involvement has become a key, if perhaps unexpected, element of the Copa program. "We always hoped that our players would enjoy the concept and connect with the activities," Hunzeker said. "We had no idea how much they wanted to be active participants in the storytelling and fan outreach." Class A Advanced Salem's entire Copa identity, for example, was inspired by its players, including Red Sox prospects Victor Acosta, Roldani Baldwin, Darwinzon Hernandez, Algenis Martinez, Joan Martinez and Bryan Mata. "Boston does ESL classes for our Latin players, and we got them involved with coming up with our brand," Salem president and general manager C. Ryan Shelton said. "Our mascot Mugsy is incredibly popular in our area. Over the last 20 years, two different affiliations and ownerships have tried to change the mascot, and the fans did not respond well. Mugsy's made it through, but one of the players asked what type of dog Mugsy is. He's a Saint Bernard, so our team is the San Bernardos de Salem." Salem's sugar skull Mugsy logo is both an extension of the club's heritage and a new one entirely. "It's a really neat concept, too," Shelton said. "We're still able to maintain our brand and color scheme, and we've wanted to highlight Mugsy for years. This just seemed so natural as a way to really bring him to the forefront in our identity." Abramson echoed those thoughts as GM of one of the few Minor League teams with Spanish language radio broadcasts and social media channels. "I do think everybody has been very proud," he said. "For us, because we do so much in that space, because our games are broadcasted in Spanish on the radio and [players'] families can listen to that on the radio, it comes across as authentic. It really means a lot. One of the coolest things is that on media day and Opening Day and other days at the ballpark, our Spanish-speaking players do more interviews than our English-speaking players. We have such interest from the Spanish-speaking and Latino media outlets that they have as strong if not a stronger contingent of reporters at the ballpark for those events." Back in the Tri-Cities, the Dust Devils are still three months from Opening Day, but their anticipation is in midseason form. "I think the most exciting part is what we've already experienced a little bit of, that excitement that the committee had," Ebert said. "Hopefully that excitement flows right into the Hispanic community as a whole. To me, that's the success. We're not doing this for some sort of win for the Dust Devils. We are doing this because we want to reach out to that community and bring them in to what a lot of our community here in the Tri-Cities is already experiencing and give them something to be proud of and know that we are honoring and are appreciative of what they do for our community."